Digital marketers throw around phrases all the time. We talk about form abandonment tracking, A/B testing, buying cycles and a whole heap of other things which often go over clients’ heads. These things which make so much sense to us, make very little sense to them. So what is the ‘buying cycle’? Most eCommerce website owners will take for granted that they know all they need to about their products too – and of course they do, it’s their job – but fail to understand that the user is often clueless. What they do not you need to appreciate is that each user that visits your website is treading along the buying cycle and that it’s your responsibility as sellers to ensure they walk in the right direction. How Does The Buying Cycle Work For eCommerce Websites? Though the smart readers that you are will have noticed that this isn’t a cycle at all, but rather a linear, finite line which is fundamentally unhelpful to any eCommerce website owner. I mean, what information or strategy could you possibly glean from this? Instead what we suggest to our clients is that you consider the digital marketing buying cycle. This combines the push and pull techniques required from an eCommerce website with the customer’s journey. 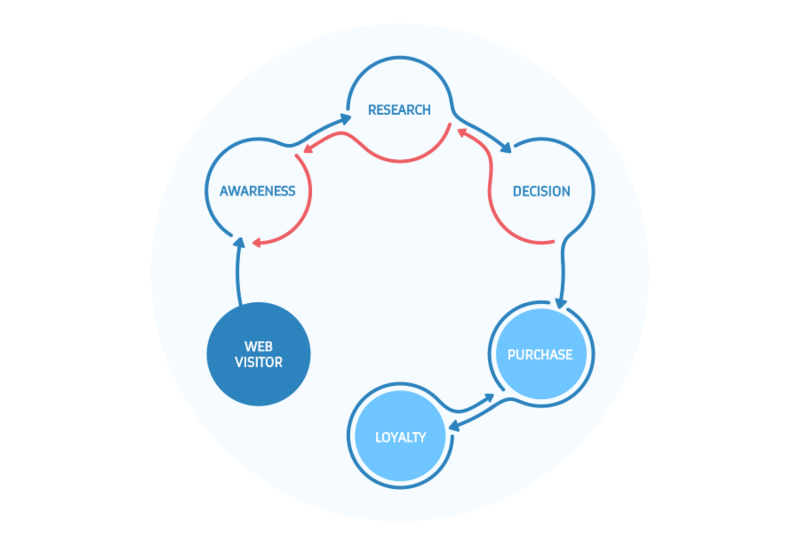 As with the above example, our customer buying cycle begins with awareness. Gaining awareness is the first step that any company needs to take and, for many unsuccessful companies, the last. Making customers aware of you is the smallest piece of the puzzle, though often mistaken for the most important. Don’t make that mistake. At this stage customers are aware of what you have to offer, but they will want to research your products; find out whether what you offer is the best available and, more importantly, the best for their needs. Through creating customised content, long-tail keyword pages and blog entries, you need to help them figure out that you’re the best for their needs. The customer knows what they want, why they want it and, if you’ve done your job right, consider you one of the best for providing the product. Now what you need to do is pull them into your net. At this stage your sales funnel needs to give them the simple facts which demonstrate that it is what they want in no uncertain terms. The two concerns that you need to address now are: what their peers think & whether they may be any unforeseen circumstances. The first of which will be addressed here. A lot of products are shared on ‘dark social’ (what is dark social). Here your customers are asking for their friends’ opinions. Make it easy to share your products, and make sure images and pages are optimised for mobile. A poor webpage can make the difference between one friend saying “love it!” or “I’m not so sure.” Allay that doubt. You’ve got them this far. They’ve decided that they want you to sell to them, don’t flake out now! Make purchasing from your website as simple as possible. We often see sites that start adding charges on, complicating delivery options or issuing reams of forms. Do as much as you can here to ensure a simple transition from decision to delivery. Put your returns & delivery costs on the product page. Do not introduce new information at the checkout. Optimise your checkout process by getting rid of unnecessary forms. Store relevant information in cookies. Introduce loyalty schemes if purchase is made. THE most important stage, and as any of our clients will tell you, the stage which we insist you visit at each and every step. Ensuring the best customer experience is an absolute must, it will mean that any attempts to re-engage with them will be greatly received, it will mean that they will advocate your brand and your products, it will mean that they come directly back to you the next time they need anything. How do you achieve this? Through a holistic approach to your marketing technique and through understanding that the end game for any eCommerce website is to make every user who visits the site, loyal to the brand. One way of doing this is by creating loyalty schemes, such as Boots have done with their ‘Boots Advantage Card’. One of the most successful of its sort. The next is to keep in touch with your customers through relevant, interesting content. HIGHLY personalised content is difficult, but by producing a content strategy that will be relevant to the majority of your users you can hope to appeal to the masses. This can then be narrowed down over time by the reaction you get from your email marketing, for instance. This is just a small insight into the tools and tactics you can use to work with your eCommerce users’ buying cycle. For more information, let’s have a chat.